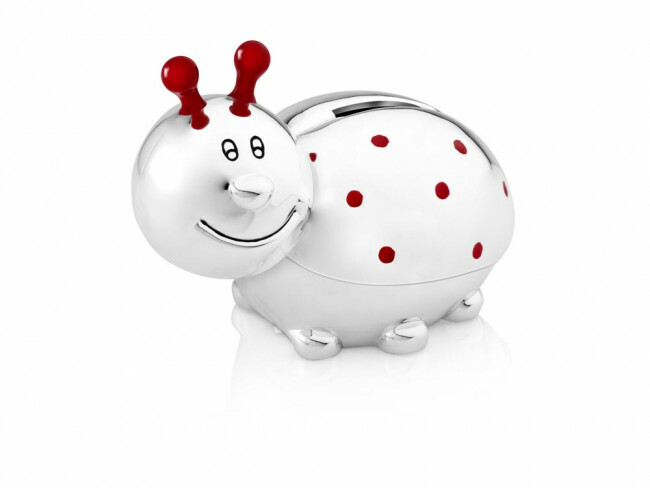 Money Box Ladybird 11x8,5x6,5cm sp./lacq. Money Box Frog 10x9x9cm sp./lacq. Money box in the shape of a frog with a golden crown. The money box is silver-plated and lacquered, and therefore requires no polishing. The money box can be engraved, making it ideal as a personal (birth) gift. Money box in the shape of a ladybird with red spots. The money box mill is silver-plated and lacquered, and therefore requires no polishing. The money box can be engraved, making it ideal as a personal (birth) gift. You're reviewing: Money Box Ladybird 11x8,5x6,5cm sp./lacq.